his years Fiesta has one foot planted in the past while the other steps into the future. Thats the idea behind "Para los Ni�os" or "For the Children," the theme created by Mike Danley, El Presidente. "Fiestas mission is basically to pass on this special way of life, this looking back to the early California period and passing that on from generation to generation," Danley said. "Fiesta involves thousands of children. So I thought this would be a good year to pay recognition to all of the childrens involvement." New this year will be "Run with the Bulls," a spoof to keep the children  and their parents  entertained before the Old Spanish Days parade begins on August 1. Runners recruited from local high schools, athletic clubs, Santa Barbara City College and UCSB will run the parade route, chased by other runners wearing papier-m�ch� bull heads. Inspiration for the charade struck Danley while he was eating a taco at last years El Mercado de la Guerra. "All of a sudden, a running group came through, must have been 30 or 40 of them, wearing sombreros and serapes," he recalled. "The whole crowd just stopped and cheered them on. It was really fun to watch." This years parade entries will also tie in with Para los Ni�os. Saint Barbara, as tradition dictates, will ride the first float. Next will come a float created by Friends of the Lobero, carrying a group of children listening to a storyteller relating the history of Santa Barbara. The floats that follow will depict historical vignettes, including the landing of French admiral Hippolyte de Bouchard, who looted and burned Refugio Rancho; the 100th anniversary of All Saints Episcopal Church; the pre-Hollywood Flying A Studios; and the first train to pull into Santa Barbara. "History is basically passed on from parent to child or grandparent to child," explained George Armstrong, parade co-chairman. "Thats what were going to hopefully show... the idea will be that children will be watching." Scores of local schoolchildren will also be reading about Santa Barbaras history year-round. Stella Haverland Rouse and Mahri Kerley, owner of Chaucer & Co. Book Store, are donating 1,000 copies of Rouses paperback book, "Santa Barbaras Spanish Renaissance & Old Spanish Days Fiesta," to fourth-grade classes in Goleta, Santa Barbara and Carpinteria. "Fourth grade is when they study California history," Danley said. "Its really nice because the kids can read about the Presidio or the De la Guerra mansion or whatever... and connect this history to actual buildings." For many locals, memories of El Desfile de Los Ni�os are among their first remembrances of Fiesta. Between 2,500 and 3,000 children are expected to walk, ride, dance or move by some other means of locomotion down State Street, from Victoria Street to Ortega Street, in the Aug. 2 childrens parade. The Santa Barbara City Parks and Recreation Department sponsors the event. Cultural Arts Supervisor Curlen Lee said she anticipates about 175 entries, and shes looking for more performing groups to participate this year. Free ice cream greets the children at the end of the parade route. The pint-sized version of Noches de Ronda, the three-night extravaganza of adult dancing and entertainment, takes place the afternoon of Aug. 2 at the Courthouse Sunken Garden. "Part of this was started back in the early 1950s as a basic catch-all for younger performers who were really too young to perform in the evening show," said Diana Vandervoort, who was instrumental in running the event for many years and is executive secretary of Old Spanish Days. "We have upwards of 250 to 300 kids doing a variety of things. Everything from ballet to break-dancing... I dont know of anything cuter than Tardes de Ronda, other than the childrens parade." Among the dancers this year will be youngsters from Rose Marie Cruzs studio, ranging in age from 3 to 13. They will perform 15 different dances, including classical Spanish, flamenco, jazz and hip-hop. Meanwhile, dancers from Ellen Skippers Classical Ballet Studio and West Coast Ballet will perform excerpts from Paquita and Don Quixote. Closing out Fiesta on Aug. 3 will be the 31st annual free Fiesta performance of the West Coast Symphony, conducted by Christopher Story VI at the Courthouse Sunken Garden. "We usually play pretty meaty stuff, but its good to expose kids to classical music," Story said. "Being 31 years old now, kids who first heard it are now bringing their children." Teen-agers are also members of the orchestra, including Nathan Maurer and Krystine Ogella, both cello; Nicole Tondreau, trombone; and Christa Mulka, principal viola. The program will open with Schuberts Rosamunde Overture, followed by Brahmss Violin Concerto in D Major and Schuberts Symphony #8 in b Minor, "The Unfinished Symphony." For the finale, the orchestra will play the Intermezzo of Bizets Carmen Suite #1. Kerry Walsh, the principal flute player, also sings opera. During the Intermezzo, Story said Walsh will play her flute as well as sing the Seguedille. 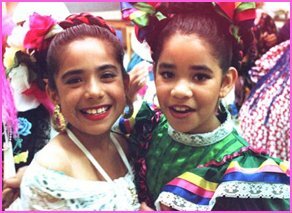 In an additional nod to "Para los Ni�os," entertainment during intermission will feature dancing by local children. Youngsters will get all gussied up for "best-dressed cowboy" and "best-dressed cowgirl" contests at the start of each of five professional rodeo performances at the Earl Warren Showgrounds, July 31-Aug. 3. Once the 4- to 6-year olds find out whos decked out in the finest finery, theyll take turns trying to stay astride lambs in the "Mutton Bustin" event. "Theyre guaranteed all going to end up in the dirt," said Josiah Jenkins, co-chair of the rodeo committee. While the performances require tickets, spectators can watch junior roping competition for free on the morning of Aug. 1, with riders up to 17 years old competing in team roping, calf roping and junior breakaway. Also free is an Aug. 2 horse show, featuring trail, pleasure and equitation classes with age divisions ranging from 10 years and under to 50 years and older. Jenkins expects 700 to 800 contestants to compete in the Aug. 1-2 events. The Big Mega Loop, Scrambler, Zipper, Quasar Two and Monster Madness are just a few of the 20 rides at this years carnival that are guaranteed to make some riders scream with excitement  and others scream in despair. J.A. Blash Shows, based in Chino, has operated the carnival in the parking lot near Santa Barbara City Colleges La Playa Stadium for more than a decade. The concessionaire splits the profits with Old Spanish Days. "Last year, we raised $11,000 out of the carnival. The year before, it was $10,000," said Miguel Avila, chair of the carnival committee. "My goal is to keep it going up." As a prelude to Fiesta, Old Spanish Days sponsored a theme section at Art for All, a fund-raising event sponsored by The Arts Fund of Santa Barbara in May. Children created some 20 different miniature Fiesta parade horses and floats bearing dancers and colorful flowers. During Fiesta, the creations and photographs of their creators will be on display in select downtown businesses. Starts at the west end of Cabrillo Boulevard, proceeds east to State Street, then north up State Street to Sola Street. Free. Tickets for bleachers, reserved seating: Arlington Ticket Agency, 963-4408. Starts at Victoria Street, proceeds on State Street to Ortega Street.